Despite three decades of heavy marketing of energy efficiency by utility programs, service and product vendors, and government, large and mid-sized commercial facilities can still do more to reduce business costs and emissions. These facilities account for roughly ten percent of non-transportation energy use in the United States. Recent engineering and economic studies consistently find that the typical large and mid-sized commercial facility could cut their energy consumption by twenty to thirty percent, through capital and operating improvements that satisfy most firms’ internal investment criteria. However, in many areas of the country, participation in energy efficiency programs by commercial facilities has begun to decline, threatening the achievement of state environmental goals. What are large and mid-sized customers doing to manage energy use and costs? In what specific ways do these activities support broader business goals and values? What distinguishes firms that actively pursue energy efficiency, from those that do not? What broad areas of opportunity to increase energy efficiency remain? 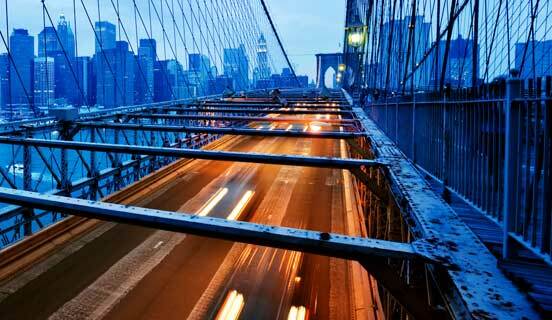 How do customers respond to energy efficiency service offerings and public programs? In 2015, the survey focused on managers in a nationwide sample of five hundred commercial facilities, with more than one hundred employees. The sample was designed to be representative of the national population of such facilities, in terms of building type (principal use) and number of employees. The sample was administered online to a panel maintained by Survey Sampling International. Surveys were completed in December 2015 and December 2016. Most large and mid-size commercial facilities pursue energy efficiency through capital investments and O&M. However, significant opportunities remain in inactive market segments, and for improved energy-related O&M in all segments. 65 percent of facilities set energy savings goals. 50 percent of facilities engage executives in reviewing progress against savings goals. While the prevalence of basic energy management practices is encouraging, the findings indicate that roughly a third of large and mid-sized facilities have not adopted these practices. These facilities and their owners represent a prime target of opportunity for greater energy savings. 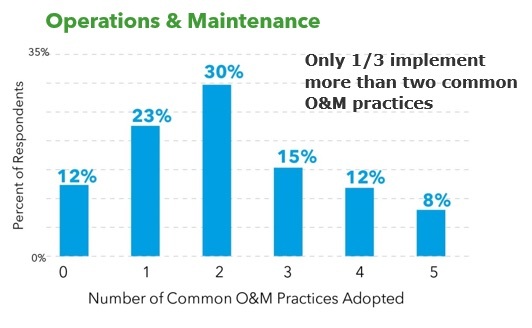 Managers were asked whether or not they regularly undertook six common energy-related O&M practices, including preventive maintenance of HVAC equipment, and testing of controls to verify settings and control sequences. Only thirty five percent of respondents reported implementing three or more of these practices. Another thirty five percent reported implementing one or none. Forty-six percent of facilities undertook capital improvements valued higher than $50,000 over the two years prior to the survey. Energy efficiency was the major driver and component for these improvements. 58 percent of facilities with major capital improvements identified reducing energy costs as a key project objective; 30 percent identified reducing energy costs as the most important objective for all capital improvements. 89 percent of all major capital improvements included at least one energy efficiency measure; 67 percent included at least two measures; 35 percent included at least three measures. While adoption of energy efficiency practices and capital measures are related to conventional segmentation variables (such as facility size and use), corporate policy and leadership support have a far stronger statistical association with those activities. 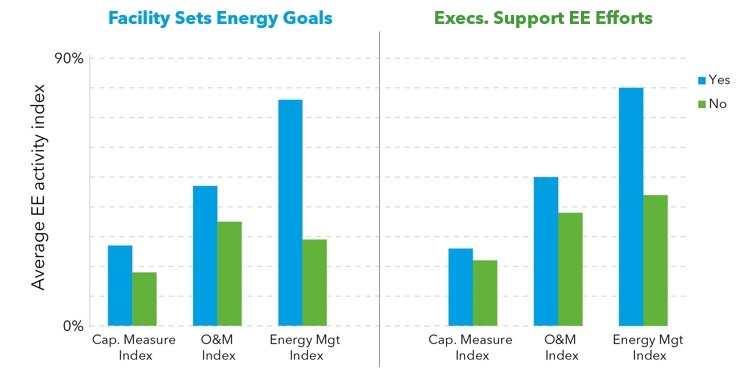 After controlling statistically for the effects of facility size, composite indices of adoption of capital measures, O&M practices, and energy management, activities were significantly higher for firms that set energy savings goals and received executive support for energy efficiency activities, than for those that didn’t. The majority of facility managers view energy efficiency as proven cost control and investment strategy. Most sample managers believe that energy management and efficiency investments advance core business values, including customer and staff retention and improved profitability. Customers in states with strong utility programs showed higher levels of adoption of a selected range of energy efficiency. Rates of adoption of various measures and practices were compared between facilities in states among the top 13 for energy efficiency programs and policies (as rated by the American Council for an Energy Efficient Economy). Facilities in strong program areas had significantly higher levels of adoption (at the time) of advanced energy efficiency products such as LED lighting and high efficiency HVAC, as well as for energy-related O&M in general. However, equipment vendors have a higher influence on energy equipment purchases than utility or government programs. The findings suggest two effective strategies to reach inactive customers. Using workshops, case studies, and other publicity, recruit local business leaders in strategic, local economic sectors, to serve as ambassadors for the energy efficiency business case. They will be best at convincing peers and competitors to establish goals, and direct management attention to energy efficiency practices, both of which are strongly related to the adoption of capital and operating measures. Tap into local vendors to sell energy efficiency. This “trade ally” strategy is commonplace, but the current market calls for excellent execution. Mitchell Rosenberg is a Director in the Sustainable Energy Use Services business unit of DNV GL. 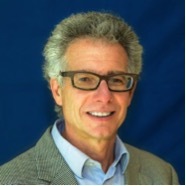 He has over 30 years of experience in market research and the design, delivery, and evaluation of energy efficiency programs. Rosenberg headed the Commercial Facility Pulse Survey to characterize the attitudes of commercial facility managers toward energy efficiency and to use these insights to identify strategies to increase program participation in that segment.